The story behind Johannes Vermeer’s 1664 painting “The Concert” is a pretty incredible one, especially since it is all that&apos;s left of the masterpiece. But this is the 21st Century. When something precious goes missing, we don’t simply shrug our shoulders and chalk it up as a loss. With the incredible technology at our disposal, there’s an even better solution: Make another one. 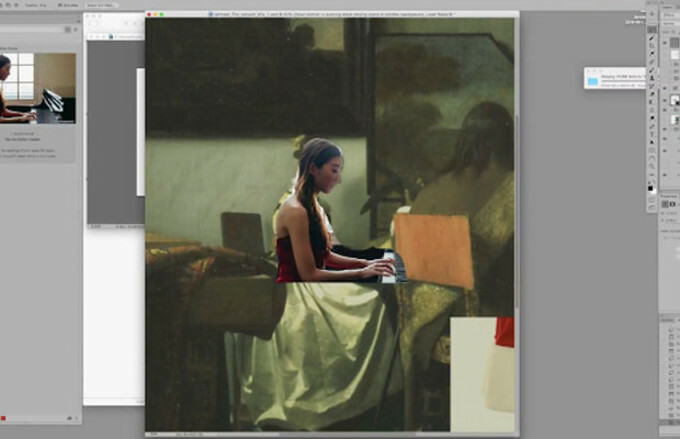 That’s exactly what artist and photographer Erik Almas did in his recreation of Vermeer’s “The Concert.” He used some carefully selected stock photos and the amazing capabilities of Adobe Stock to bring Vermeer’s classic back to life. Adobe Stock allows artists uninterrupted creativity by including its stock photo search functionality within the software itself. Users can search through an enormous library of stock photos in Photoshop, and once they finalize their selections, purchase or license the photos within the app without having to go back to a website to do so. As you’ll hear directly from Erik below, this is a huge help for the design process, especially when you’re recreating a lost masterpiece that was painted over 350 years ago. How do you take on a project this big? You take it on by not knowing how big it is. If I had known, I would not have been able to take it on. It was quite overwhelming at times, but I knew that once I took it on I had to finish. I think it’s hard for someone to know “how” to take it on going in, as you have no idea what it will actually require. But then you find a nose, and then a face, and you build from there. Walk us through your process of creating this piece. Usually, I start from the background and build forward. I do that with all my photography and composites. [In this case], I started with the back wall, then the picture frames on the wall, then the floor, then the structures in the room (like the furniture). It’s always in the back of your mind, but it’s a little scattered and all over the place at first. What were you thinking about when you were creating this? I think about everything and nothing. Sometimes I don’t think I’m thinking about anything, while other times I’m thinking about big questions, like “Why am I doing this?” [Laughs]. Your mind just wanders. It’s not really one thought. It’s kind of one big contemplating exercise. What different areas of the painting were the hardest to recreate? The faces. Without a doubt, it was the faces. Chairs are objects that are made a certain way. A cello is a cello. But a face is never the same. It’s impossible to be honest. I think I did a good job with the lady at the piano. But the lady standing up singing, I don’t think that’s finished. If I had a week or two, I would keep at it and see if I could solve it. But yeah, the face—the organic matter—is definitely the hardest. What was the most creative way you used stock photography to match the painting? When I started the process, it was about trying to find the exact piece for each [component of the painting], but that didn’t work. I could not find the right cello [photo] from the right perspective. But I could find the back of a cello that had the right perspective. So the cello you see is actually from the back, and then I laid the front of a different cello on top of it. Even the legs of the man that are underneath and in the dark are [comprised of] three different pieces that came from three different places. The skirt of the woman sitting is actually a silk blouse from a woman in a photograph. It ultimately became about the fabric and the light quality, and then I sort of shaped it into a way that would fit into the painting. How did Creative Cloud’s integration change your process? This was really my first time using Adobe Stock. It made it a lot easier. When I started the first few days, I didn’t even have the latest version. But when I got the update and I could add the libraries, it was much easier since it gave more immediate access [to photos]. That library was a great feature that really made things a lot easier. How did Adobe Stock make recreating this piece easier? The integration into Photoshop, and having it within the software made it much easier—being able to drag a high res file directly into the piece rather than licensing and downloading, etc. If people realize those features are there, I think they’re really going to want to use it. It’s really convenient having it there all in one place. How many Adobe Stock photos did you use? I licensed 240 pictures, though I didn’t ultimately use them all. In the end, my file had 898 layers. How do you use stock photography in your art? If there are parts and pieces I can’t access myself [like a picture of a moon or a certain animal], I’ll use it. When it’s an element that is tough to capture myself. How does being able to work on photos with watermarks help your process? It was really amazing, to be honest. It allows you to use higher resolution files, and it’s way more convenient. You could search the library, drag a photo directly into the project, morph it, and change it. Then, if you want to use it, you just buy it, and the watermark goes away. I thought it was a pretty amazing experience. What was the feeling you had when you completed the artwork? As I mentioned, I don’t really think it’s complete. [Laughs]. But all in all, it took about three weeks [to complete]. Even though it’s based on someone else’s work, it’s really gratifying to get it done.